The team interviewed Stephen Howell at #MegaDojo. Stephen spoke about his work and why he returned to #MegaDojo this year. He also spoke about what inspired him. The team interviewed some of the contestants in the Hackathon and Scratchathon competitions. The team interviewed Sean O’Brien at #MegaDojo. Sean told us about his magic show and what he does. He also spoke about why he loves coming back to #MegaDojo each year. The team interviewed Sean Kelly MEP at #MegaDojo. He spoke about why an EU wide Code Week is important and also about how important Ireland’s involvement is. We also learned about the EU Coder Dojo that is happening next weekend and why Sean invited Coder Dojo to the European Parliament. The team interviewed Ken Whelan. Ken told us a bit about what he does and about his presentation at #MegaDojo. He spoke about the relationship between music and art and also about how important CoderDojo is. The team interviewed Mags Amond at #MegaDojo. Mags spoke about what she does and how she is getting on today. She also spoke about EU Code Week and how she is involved. Caitlin and Chris interviewed Sean Kelly MEP. Sean spoke about how he is actively involve in CoderDojo and how he brought it to the European Parliament with the founders. He also told us about how he thinks CoerDojo is impacting Ireland in a positive way. 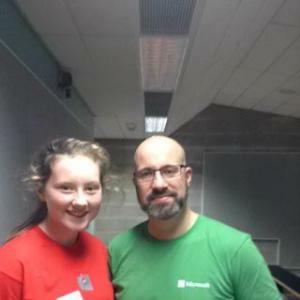 Roisin and Chris interviewed Stephen Howell from Microsoft. He told us about how he thinks people should be able to create things on computers. 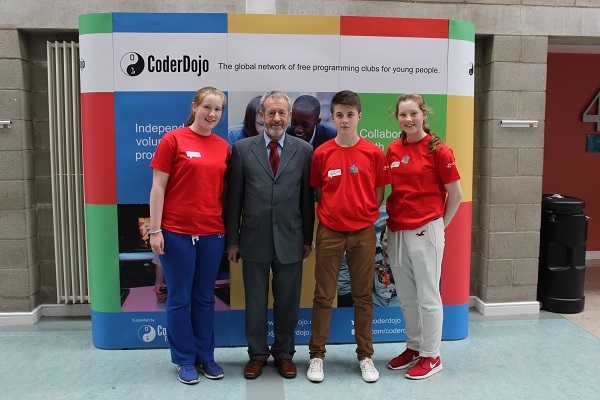 He also spoke about the importance of CoderDojo and what he spoke about in his workshop. He gave a workshop presentation on how to use Scratch with Xbox Kinect. Chris interviewed some of the exhibitors at MegaDojo. He interviewed Foróige about their entrepreneurship promramme an why they are at MegaDojo. He also interviewed Apps for Gaps who told us about their competition that they are running. He also interviewed Fab Labs who told us how to useful and easy it is to use a 3D printer.